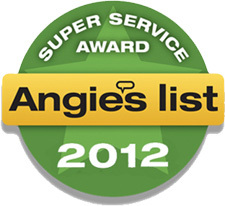 Welcome to Rain Away Seamless Gutters! 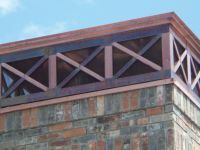 Custom Made On-Site To Fit and Color Match Your Home! 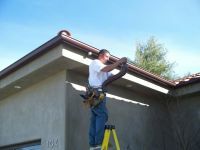 RAIN GUTTER INSTALLATION, SERVICE & REPAIR! Aluminum, Bronze & Copper, 5" & 6" Seamless Rain Gutters. 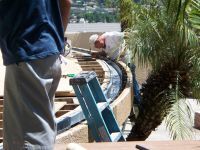 Seamless Rain Gutters with Rain Away, Inc. Rain gutters are the front line of defense for several areas of your home. Your roof, siding, basement or foundation, and lawn drainage are vulnerable without a quality guttering system to reliably and efficiently divert rainwater away from your home. 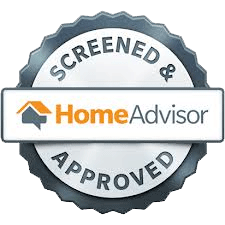 One example of this relation is that basement waterproofing involves inspecting your home's guttering system. When rain gutters fail, basement flooding is one possible outcome. Poorly designed gutters and downspouts can dump rainwater in the wrong spot causing the water to back up into the home or pool in one spot on your lawn, creating a host of problems. Leaks in the seams or attachment to your home can lead to a small, but insidiously dangerous flow of water that can eat away at your siding or back up into your roofing and lead to roof, drywall, and insulation damage. 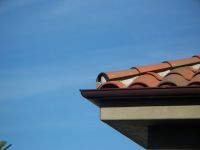 Few homes are without rain gutters in California and for good reason. 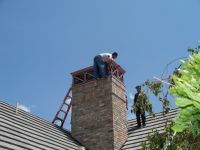 Whether you need an initial installation or to replace older gutters, Rain Away Inc, has helped homeowners throughout California with installing reliable and long-lasting guttering system. 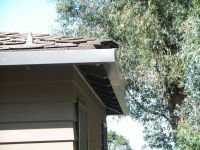 Materials: Though gutters, in theory, can be fashioned from nearly any material, metal and vinyl comprise the vast majority of gutter installations in California. For performance galvanized steel is best. Aluminum is somewhat cheaper, and can be molded into various shapes and sizes with unlimited colors. 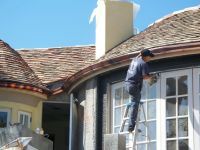 Wood gutters are essentially a thing of the past, although they are still installed for homeowners with a nostalgic bent or for historical homes. 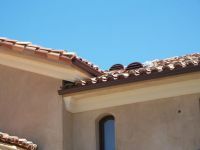 Copper gutters offer a unique and coveted look but are cost-prohibitive for most homeowners. 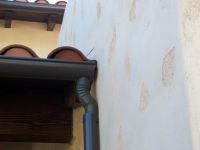 Seamless vs. Sectional: Seamless gutters are the new standard and account for metal's dominance in the guttering industry. Fabricated to the exact dimensions of your home, seamless gutters eliminate the joints between gutter sections that is the most common source of gutter failure. Though seamless, metal gutters are slightly more expensive, the dependability of these gutters outweighs the cost for most homeowners.